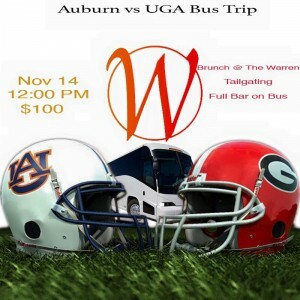 Join The Warren for an Auburn vs UGA Bus Trip! Thanks for looking sports fans. To start off, this is a catered charter to and from Auburn for the Auburn University Tigers vs The University of Georgia Bulldogs football game. This does not include your ticket to the game. Brunch with a mimosa and bloody mary bar at The Warren City Club in Virginia Highlands, and a chartered bus with full bar and snacks for the bus ride down. We meet at 7am for a delicious breakfast, then get on the road for the big game at noon. Parking is included and we’ll give you maps of the area where we park, the stadium, and to the local bars, as not everyone has tickets, but you still gotta see the game. Following the game, we will meet back at the bus for another open bar, BBQ buffet, and a little down time before we get on the road back to Atlanta. We park back at The Warren City Club once we return, for ease of travel. We have space for 36, as one row is dedicated to the bar. We are halfway full now, so don’t wait until the last minute to book your ticket! To recap, $100 gets you safe travel to and from Auburn, food for the day, alcohol for the day, and the opportunity to meet new people. Join a good mix of Auburn and UGA fans, ‘cuz we’re all one SEC family!